Of the 10 U.S. states with the highest numeric growth, just one, Colorado, sees snow on a regular basis according to the latest U.S. Census data. Air-conditioning and an aversion to the cold continue to increase interest in warmer climates. The state with the highest population growth should come as no surprise. 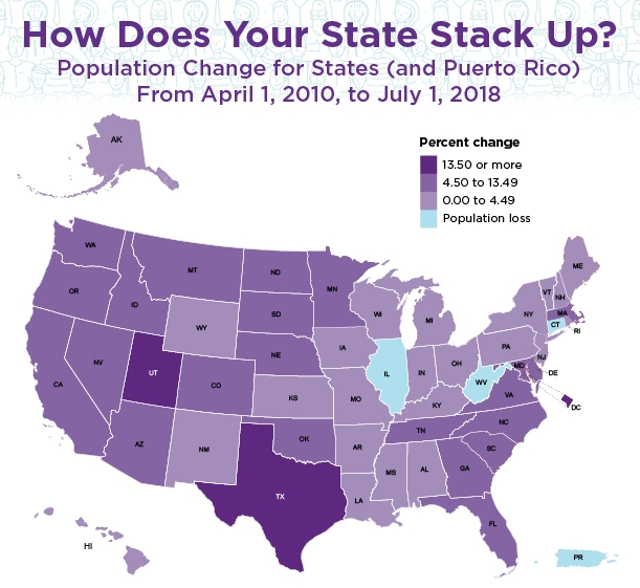 Texas’ population grew by 1.3 percent, equaling 379,128 residents from July 1, 2017 to July 1, 2018. 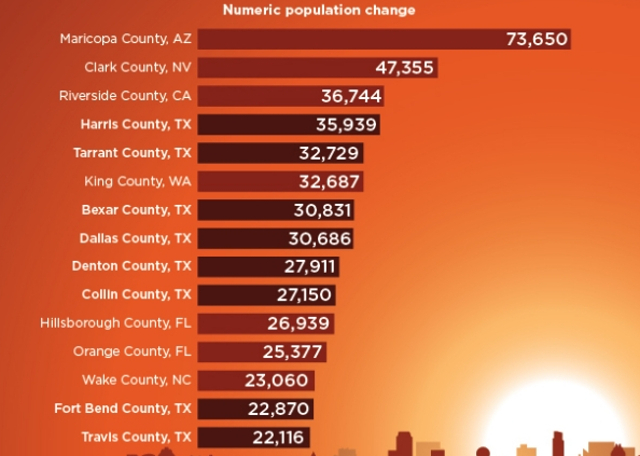 Texas also retains its crown as the second-most-populous state at 28,701,845, still some 11 million fewer than No. 1, California’s 39,557,045 residents. However with Texas adding more than twice the new residents as California, we may catch them yet. The US Census Bureau, along with researchers from Harvard and Brown universities, tracked the economic trajectories of 20 million children beginning in the mid-1980s (aged mid-30s today). The result is the Opportunity Atlas, an interactive map that overlays multiple data points onto each of the 70,000 Census tracks in the country (a Census tract contains 4,200 people). Data tracked includes parental income level, race and gender along with incarceration rates. The most interesting conclusions showed that while average neighborhood income is certainly a key indicator, neighborhoods with similar incomes, in close proximity, produced startlingly different outcomes for children. It’s here where I’ll say that while the data collected can be used by policymakers to influence spending and programs, there is no specific “eureka” that turns around the economic trajectories of a neighborhood’s children. Bethany Erickson already looked at this issue thoroughly, but there is more to be said about the numbers. The major levers are neighborhood income (what I’ll call “hope”), two-parent households (familial stability), rates of incarceration (despair) and, of course, race and gender. What’s interesting is that easy conclusions can’t really be made. There’s a “secret sauce” at work.